The cost-based optimizer of IBM DB2 for z/OS has continually evolved since its initial inception. Support has included new optimization algorithms, join methods, complex relational data structures, such as star schemas. DB2 for z/OS V8 has provided access path visualization and a Statistics Advisor function through a new Visual Explain. 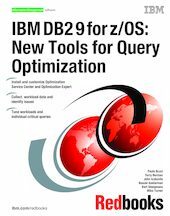 DB2 9 for z/OS starts addressing the challenge of reducing cost of ownership by extending query optimization through expert-based query and workload analysis, server enhancements, and an Index Advisory function. These functions are delivered with two tools: DB2 Optimization Service Center and DB2 Optimization Expert. This book helps you understand the installation, customization, and usage aspects of the tools. You are guided through scenarios of gradually increasing complexity where the functions of the tools are exploited for query optimization.